Following on from the success of the original Ward-D-Vision and 700, we have introduced this new improved longer range series which has the benefit of an upgraded 800x600 display with variable brightness for the highest resolution image from a digital night vision add on system yet. 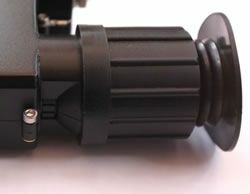 We have also upgraded the housing to a 4 jaw clamp arrangement with multi position clamp so there are no issues with clearance between the night vision unit and the rifle's bolt. The Ward-D-Vision 800 series digital night vision add on system is designed to be coupled behind a normal day telescopic sight to give it night vision capabilities. The system will work with most day telescopic sights, providing they have an adjustable objective, or preferably (for ease of use) a sidewheel focus system. This new system is lighter, has higher resolution and far superior ergonomics than the conventional tubed systems it replaces. Useable range (for shooting not just eye shine!) is up to 400m when used with our Ward Black Sun B671 and B672 aspheric IR illuminators and 250m when used with the small B20 IR illuminator. 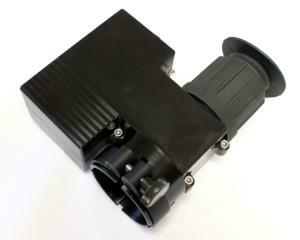 Note: The system requires an IR illuminator to work in complete darkness. This night vision system is an excellent choice for someone wishing to have night vision capability on a number of rifles. It can also be used off the rifle as a night vision observation device. The new 800 series is available in two models. 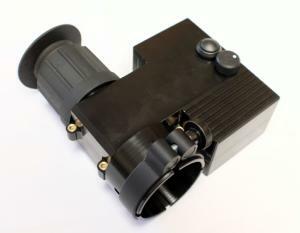 The 800S for standard use which produces a 1:1 representation of the users view through the rifle scope or the 800L, longer range model which provides a slightly magnified view through the rifle scope which allows less optical magnification to be used and let even more IR light to the night vision device. This magnified view is also great for scopes that have a fine reticule. The Ward-D-Vision 800 unit is manufactured here in the UK at our premises so spares and accessories are always available. Great product !! wonderful fun in the dark thank you. Fantastic bit of kit just getting used with it after my archer broke down. If you want the best NV below £1000, this is the place to get it. Well made and works perfectly. Excellent digital add on, very happy with the product. Really good bit of kit worked reasonable on my hawk side focus but got a sightron scope what a difference as good as my pvs14 can go to 15x mag still very clear worth the investment. Stunning picture with the right 'scope... the new clamp makes mounting a doddle for clearing the bolt. Really pleased with the clarity of image of the 800L, easy to install and focus, can't wait to get out and start trying it. Could do with having a couple of shims dedicated for my two Hawke Sidewinders.